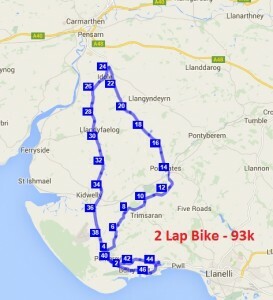 The Sospan Sizzler Middle Distance Triathlon will start with a 1.9km open water sea swim at Burry Port. This will be a mass swim beach start and you complete 2 laps of the swim course – you will swim around the Yellow and Orange Buoys. There will be a rectangular buoy near the slipway for you to turn around to start your 2nd lap. The RNLI Burry Triathlon event athletes will only be swimming around the Orange Buoys, They start 30mins after you. This bike course will take you from the picturesque coastal village of Burry Port and into the rural splendour that Carmarthenshire has to offer. The 46.43km bike loop contains just over 3000ft of climbing but does also provide plenty of opportunity to average some high speeds as you return from Idole Carmarthen. At the end of Lap 1 you will cycle back through Burry Port where there will be large crowds gathered to encourage you as you head out on the 2nd lap. 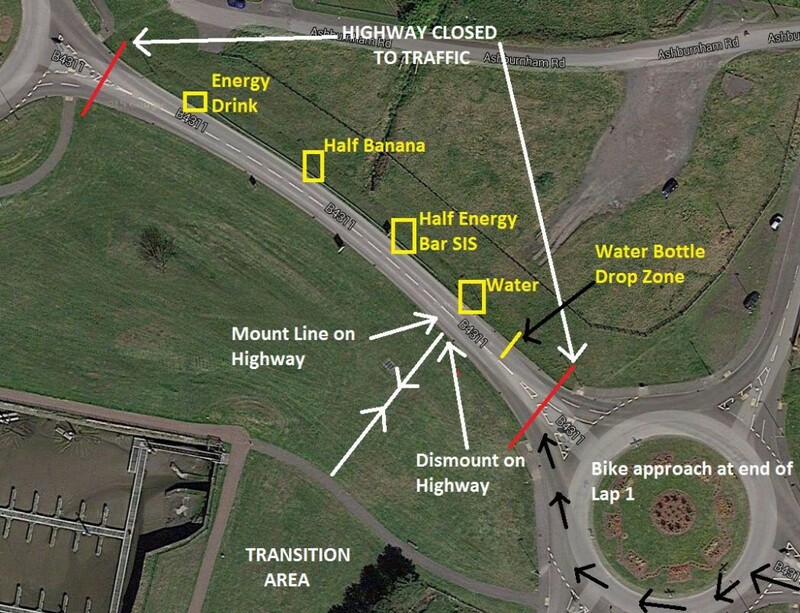 There will a feed station at 46km which is next to Burry Port Harbour and we recommend you carry two drinks bottles with you and you will be able to collect two drinks bottles at the feed station. Drinks bottles will contain High 5 Energy drink or Water. Please throw your empty drinks bottles on to the grass verge as indicated in diagram below. The run course is a fast one although the coastal wind may play it’s part! 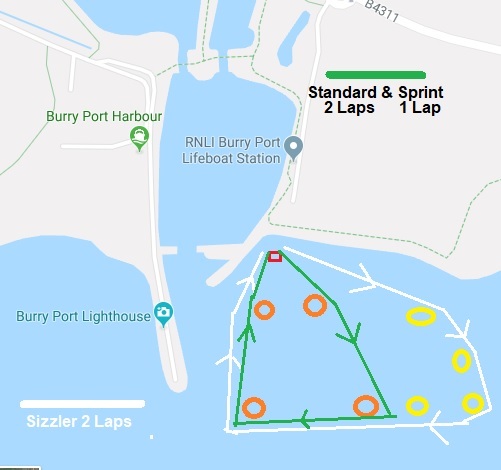 We have designed a course that will allow you to run through the supporting crowds at Burry Port Harbour on four occasions before a grand stand finish on the Sospan Sizzler carpet. The run will take you out along the Coastal path towards Pwll on a 3.5km loop, you then come back passed the RNLI Station and head out towards Cefn Sidan beach for 3.5km before returning to Burry Port harbour and then out on your 3rd loop towards Pwll. When you come into the Harbour you will have done 14km and you then head out on your final loop towards Cefn Sidan with a grand stand finish outside Burry Port Harbour awaiting on your return. You will pass feed stations at 1.75km, 3.5km, 7.0km, 10.5km, 12km, 14.0km, 17.5km and of course there will be plenty of nutrition at the Finish Line. Feed Stations at 1.75km & 10.5Km will have Water and High5 Electrolyte Drink – all other will have these plus flat coke, jelly babies, pretzels and Jaffa cakes.